Bush walking. Can you think of a better way of getting to know an area? When you stay at our Byron Bay caravan park you’ll be able to immerse yourself in this beautifully undulating region populated with sub-tropical flora and fauna. You can get a feel for a place trekking through its innermost rainforests and surveying its coastal rocks and shoreline. Not only that but the exercise itself energises while the air fills your lungs. Anyone who wasn’t hungry before they started will be ravenous by the end of their walk and looking forward to some well-earned bush tucker (or even a nice burger and chips in a nearby cafe). Bush walking also provides us with a time to reflect. Which, as well as having fun, is what holidaying in a tranquil and environmentally-friendly Byron Bay caravan park is all about. Another plus of bush walking is the fact it can be enjoyed by the whole family. Many of the walks near our Byron Bay caravan park are short distances (around 2 kms), while others are an average of 8 km to 10 km). The serious bushwalker can, of course, go for much longer, devising his or her own routes. Here we’ve attempted to list some of the more popular bushwalks and included both short and longer versions to appeal to a wide-range of trekkers. For more details on national parks, check out our Byron Bay caravan park guide or tourism leaflets for the hinterlands of Byron Bay. 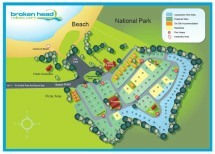 Broken Head Holiday Park boasts Byron Bay beachfront cabins as well as being in close proximity to Broken Head Nature Reserve. Sitting just eight kilometres south of Byron Bay in the Broken Head Nature Reserve, this government-designated site boasts spectacular coastal regions as well as stunning rainforest. There are two popular walks. One is from the car park on Seven Mile Beach Road to the Kings Beach – a distance of around 350 metres. While the second is from our Byron Bay caravan park and called the Two Sisters Walking Track’ and on which you’ll find plenty of lookout spots and signs. The latter is named after the Aboriginal tale about three sisters who became part of the rocky outcrops at the headland. You’ll reach this spot – which overlooks Kings Beach – after a stroll through colourful rainforest. During winter and spring you’ll find plenty of sea life and an abundance of wild flowers. It’s a walk which can’t fail to captivate. Take time out to examine Cape Bay’s lovely flora and fauna such as ancient burrawangs and bungalow palms, as well as its amazing coastline on the 5km Cape Byron Lighthouse trail. In fact, see if you can spot any dolphins, turtles, stingrays and, if you’re lucky enough and visiting between May to October, then even humpback whales on migration. Starting from Watego’s beach this trek continues up to the lighthouse and around the edges of the peaceful rainforest at Arakwal National Park until you reach the Pass. From here you’ll have impressive views to Lennox Head in the south and Mr Warning in the north. Then it’s time to turn round and head a slightly different way home to your Byron Bay caravan park or other Byron Bay accommodation. A short walk, the 3.7km lighthouse loop only takes around two hours and there’s the opportunity to take in the coastal vision for longer over a cup of tea at the pretty Lighthouse Café. And here’s an interesting piece of history for you – Cape Byron was actually named by that most famous of sailors – Captain Cook. To get the most from this walk, which is about an hour’s drive from our Byron Bay caravan park, bring a head lamp and set out in the early hours of the morning. That way you’ll be ready to watch the sun rise at the first eastern point in Australia. The 1100 metre high Mount Warning (the remnant of a volcano which erupted more than 20 million years ago) itself was regarded as very much a spiritual place by the Bundjalung and Aboriginal people who once lived there. The name Wallumbin appropriately means ‘cloud gatherer’ since the summit is often encircled by cloud. Otherwise, if you’re not a night bird (or early morning one, for that matter) then tackle the two hour walking trail during daylight. The last 250 metres of the walk to the peak is reached via scrambling over the rocks and you’ll find a handy chain there to assist you. Once at the top enjoy a seat on the boardwalks so you can sit and gaze at the 360 degrees spectacular sight that is Byron’s bowl-shaped Tweed Valley. If you’re returning then it’s another two hours and 9km in total – so you’ll sleep well in your tent or cabin at your Byron Bay caravan park that night! A shorter walk is also available called the Lyrebird Track. Near the base of Mount Warning, it drifts through the outskirts of a rainforest, past a creek and onto a viewing platform. Mr Warning can be found south west of Murwillumbah, off the Old Pacific Highway. The roar of the thundering Falls, rising more than 100 metres from the rainforest, can be heard long before you feast your eyes on this magnificent sight. Check out the wildlife too, such as the emerald dove, Albert’s lyrebird, koala, bush turkey and very probably snakes. Then there are the wildflowers – colourful orchids and lilys. There are two bushwalks in this area at 5km and 9km. The former includes a few hills as well as some rock clamouring and should take the average walker around two hours. The latter walk is double the time at four hours and both are graded Moderate to Hard. The short walk. Walking through the rainforest valley past beautiful Bangalow Palms, Holmholtzia Lily and Strangler Figs you’ll arrive at the plunge pool of the spectacular 100m Minyon Falls. And, if the weather allows, you’ll even be even to go in for a dip yourself. The Long walk. Enjoy not one but two incredible waterfalls when you take the Brush Box rainforest trail. As well as encountering the Minyon Falls plunge pool you’ll also take in the sight of Quandong Falls. To get there walk uphill from Minyon Falls and turn left at Quirks Firetrail. Incidentally, Quandong gets its name from the blue Quandong tree which is in abundance in the area. You’ll find pools near the top to help cool you down after all that exertion. Nightcap Night Vision Walk. Wear night vision goggles to watch nature’s nocturnal wildlife in the bush on a specially organised Nightcap Park guided walk. Bandicoot, frogs and Possum and well as occasional koala’s can be spotted in semi-moonlit nights while the walk itself can take anything up to 3.5 hours. A lovely pavement walk to a viewing platform which sits at the junction of Wilson River and Coopers Creek. It’s possible to spot remnants of the old wharf (once used to load rainforest timber) from the look-out spot. Still, on the subject of history (this time more recent), walk through the village of The Channon at Terania Creek to reach Protesters Falls. The Falls were named after a successful protest in 1979 which prevented logging in the area. There are signs through the rainforest to the walk, which is now a World Heritage site. Try and resist swimming in the water though it’s banned since the Falls are the habitat of the endangered Fleay’s barred frog. Sitting at Brunswick Heads, off the Pacific Highway, this nature reserve is a mere 20 km northwards from our Byron Bay caravan park. It boasts beach and rainforest (as well as great river fishing) so makes some wonderful informal bush walking. Another spot for informal bush walking, the Mooball National Park is one third subtropical rainforest. It sits 12 km south of Murwillumbah of the Pacific Highway and has a wonderful array of wildlife – many of which are endangered. These include the wonderfully-named long-nosed potoroo, the red-legged pademelon and the giant barred frog. Just 10 km north of our Byron Bay caravan park on the Pacific Highway at Grays Lane, those who prefer a quiet, contemplative walk will love Tyagarah Nature Reserve. That’s because it offers eight kilometres of secluded and unspoilt beach with a coastal heath. Beloved by those who enjoy bird watching or fishing. An area of some 5,168 hectares this park sits around 32 kilometres south-west of Murwillumbah and nearby to Nightcap National Park. There are various habitats on show such as subtropical rainforest and sclerophyll forest (both wet and dry). The same for your top half i.e. a long sleeved t-shirt. Food (in the form of quick-energy snacks such as dried fruit and energy bars. It’s a good idea to pop in to the local ranger station prior to heading off on your bush walks. Someone there will be able to tell you of any areas to avoid and what kind of wildlife you should be on the look out for in terms of photo opportunities. They’ll also let you know about the fitness required for the various trails in their reserve. Stick to the marked trails. Venturing off-route can be risky. That’s because you’re more likely to encounter snakes and other critters when you leave the path. Large leaves make great shelters for snakes and it’d be easy not to notice one. Tell people at your Byron Bay caravan park where you’re going before you leave so that if anything happens and you don’t return by an expected time, they can go ahead and raise the alarm. We feel truly blessed at our Byron Bay caravan park to have so many places to enjoy bush walking. So if you and your family are looking for things to do in Byron Bay Australia, check out our low season specials and get in quick for the school holidays. Our cheap accommodation in Byron Bay is an ideal place to relax and reconnect with nature.